What’s better than my bunnies on Monday? 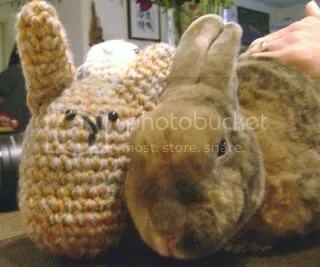 A crochet bunny that looks exactly like my bunnies! Omgosh Clara, you are so talented! While I wish I could take credit, I didn’t make them. Heck I don’t even know what the difference between crochet and knitting is. Something to do with the number of stick thingies you use right? And yes, “stick thingies” would be the technical term. Actually it was my friend and fellow foodie blogger, Steph of Steph Chows, who made them for me after I begged, pleaded, bribed asked her after seeing a crochet turtle that she made on her blog not too long ago. And it totally tickles me that they arrived *on* Valentines’ Day. I j’dore them. Those are so cute! I love those little crocheted animals. I know how to knit, but all of the patterns for little animals like those are crochet. You are so lucky to have received those! It’s sad, but no day off for me. 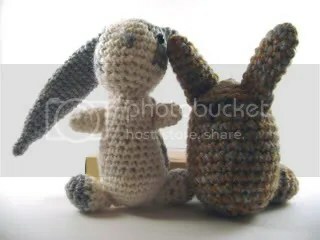 :( But the crocheted bunnies are adorable! They are too cute! …W-O-W!!! to the Steph!